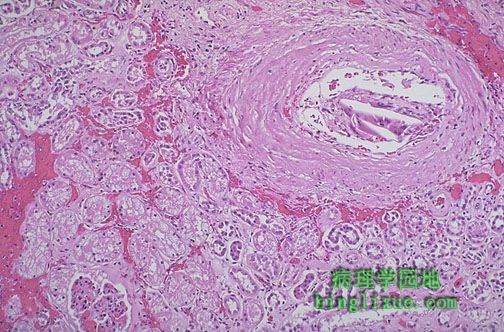 This high magnification of the atheroma shows numerous foam cells and an occasional cholesterol cleft. 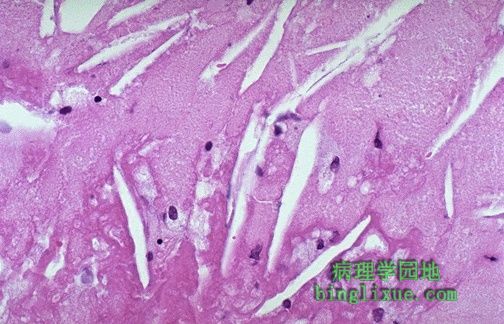 A few dark blue inflammatory cells are scattered within the atheroma. This is about as normal as an adult aorta in America gets. The faint reddish staining is from hemoglobin that leaked from RBC's following death. 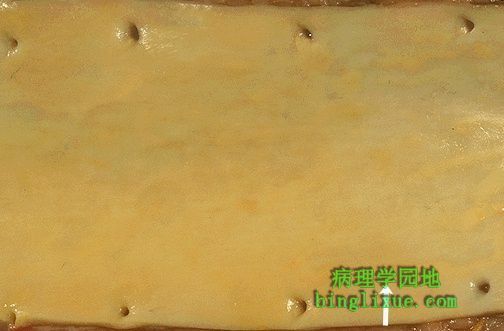 The surface is quite smooth, with only occasional faint small yellow lipid streaks visible. Put down that jelly doughnut and look carefully at this aorta. The white arrow denotes the most prominent fatty streak in the photo, but there are other fatty streaks scattered over the aortic surface. 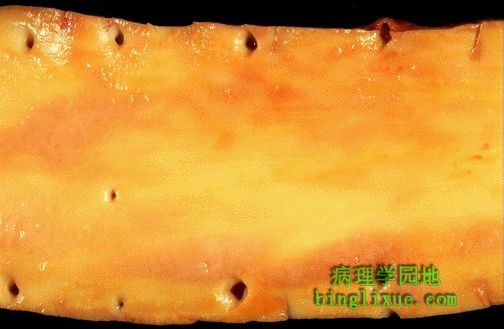 Fatty streaks are the earliest lesions seen with atherosclerosis in arteries. These three aortas demonstrate mild, moderate, and severe atherosclerosis from bottom to top. At the bottom, the mild atherosclerosis shows only scattered lipid plaques. The aorta in the middle shows many more larger plaques. The severe atherosclerosis in the aorta at the top shows extensive ulceration in the plaques. Here is an example of an atherosclerotic aneurysm of the aorta in which a large "bulge" appears just above the aortic bifurcation.Such aneurysms are prone to rupture when they reach about 6 to 7 cm in size. They may be felt on physical examination as a pulsatile mass in the abdomen.Most such aneurysms are conveniently located below the renal arteries so that surgical resection can be performed with placement of a dacron graft. 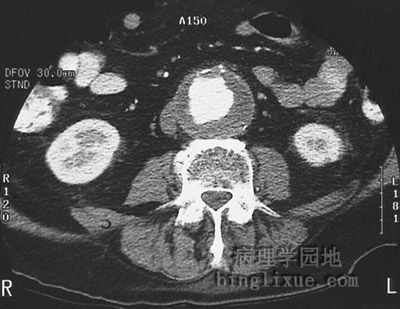 This abdominal high speed CT scan with contrast demonstrates an abdominal aortic aneurysm approximately 6 cm in diameter. At this size, there is increased risk for rupture. This microscopic cross section of the aorta shows a large overlying atheroma on the left. 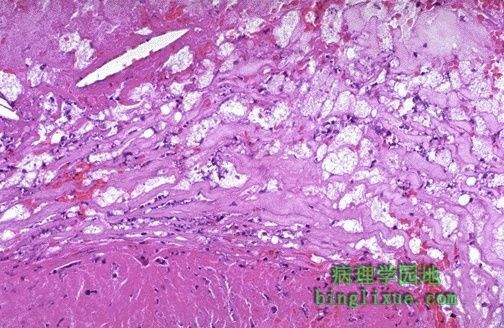 Cholesterol clefts are numerous in this atheroma. The surface on the far left shows ulceration and hemorrhage. Despite this ulceration, atheromatous emboli are rare (or at least, complications of them are rare). 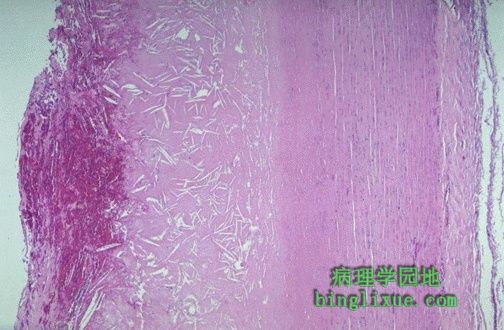 This is a high magnification of the aortic atheroma with foam cells and cholesterol clefts. 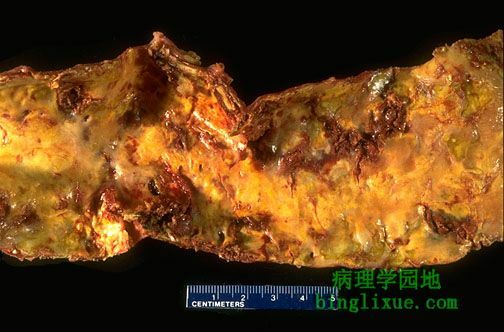 This is severe atherosclerosis of the aorta in which the atheromatous plaques have undergone ulceration along with formation of overlying mural thrombus. 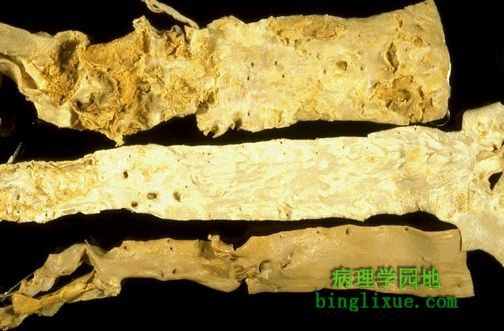 Despite the frequency of aortic atherosclerosis, cholesterol emboli are rare, or at least insignficant most of the time. 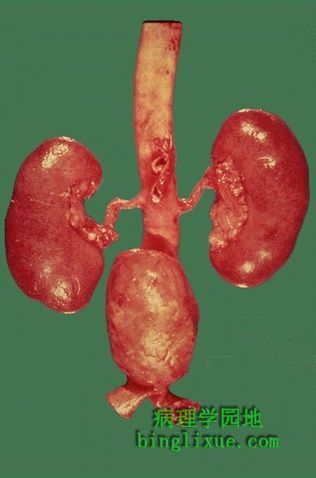 Seen here in a renal artery branch are cholesterol clefts of such an embolus. This patient had severe ulcerative, friable atheromatous plaques and had undergone angiography, which increases the risk for such emboli.